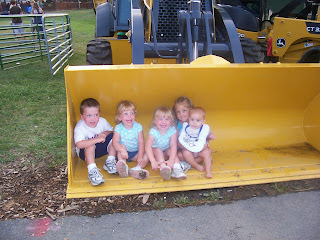 Last Thursday morning we took the day care kids to the fair and had a blast. Ken had the day off, so he came along as a chaperone. 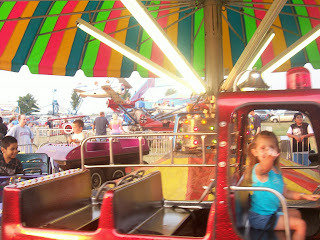 Since he had already paid admission and it was his day off, we decided to go back to the fair that evening. We met up with Stacey and her husband and kids. The kids rode a few rides together and then we parted ways. Some of the rides we purchased tickets for, and others were FREE!! 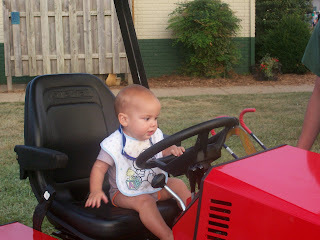 I think the kids liked sitting on the tractors just as much as they did going around in circles on the other rides. We stopped for dinner and then went back to the rides for a little while. Henry LOVED the carousel and screamed when we took him off of it. I rode the whole thing backwards while video taping! I gots mad skillz! Henry loved looking at all the lights and action of the other rides, but of course he is too young to go on any others. 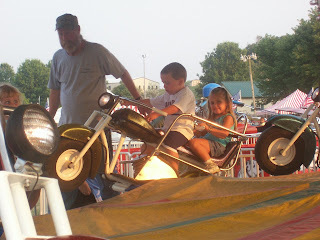 Frances tried out the cars, the motorcycles (twice), the fun house, the carousel, the swings, and another fun house. She wanted to ride the "Dragon Wagon" which is a roller coaster for kids, but they were doing some work on it and we didn't feel like waiting (and truthfully, it always makes me nervous to get on a ride they just "fixed.") Once we had used all our tickets and patience, we packed it up and headed home. These last two pictures show Frances last year on one of the cars and this year in the same car!